Partial.ly offers a seamless integration with Harvest, allowing you to provide a payment plan checkout option for your invoices. Harvest is the most convenient and easy-to-use invoicing and time tracking software. But, what about customers that have a hard time paying their invoices? Partial.ly makes it easy to offer a payment plan payment options for your Harvest invoices. Partial.ly lets you offer flexible payment plan terms to your customers, so they can start paying their invoices sooner. Make it easier for your customers to start paying their invoices so you don't have to waste time and energy chasing down clients that owe you money. Set your own range for allowable payment plan values so customers can pay you on your terms and theirs. Partial.ly communications seamlessly with Harvest. 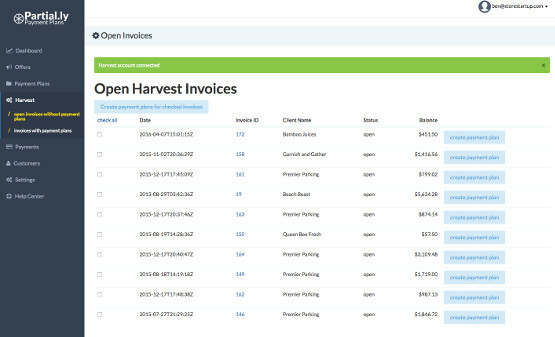 Just connect your Harvest account following the simple instructions, and all of your Harvest invoices with an open balance will display in a convenient list. Send flexible payment plan offers for your invoices, or give your cashflow a kick start; select all of your open invoices and send payment plan offers to every customer with an open invoice balance at once. As automated payment plan payments are made, the invoice balance will update automatically in Harvest, so you don't have to worry about keeping track.